Bass and Pollack trips are run in the summer with the large number of wrecks in the bay we can offer excellent fishing opportunities with only a short journey time. Anchor or drift fishing for Whiting, Rays, Turbot, Bull Huss, Ling, Bream, Tope and Plaice, can also be offered for a more relaxed and leisurely trip. Deep wreck and Conger fishing is available on the offshore sites where you will need good heavier tackle. Wrecks, reef and flat ground West Bay fishing trips are 3, 6 or 8 hours. Rod and tackle hire is available. 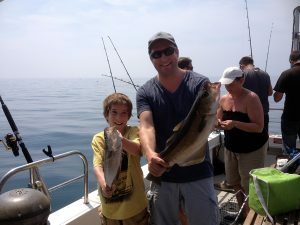 Our 1 hour Mackerel trips are very popular, often non-stop action and suitable for first time anglers. Great for families with children who want to catch some great tasting fish for the BBQ. Mackerel fishing is exhilarating and the easiest fish to catch. All you need is a rod, a weight and a set of ‘feathers’. For those who have never been this is a perfect introduction to boat fishing as you drop the line over the side, lift the rod up and down and “hey presto” all your hooks have mackerel on them. Mackerel is also a fine bait for many species of fish, so an hours mackerel fishing could fill your freezer for a whole years worth of bait! All necessary tackle is included. For deep sea fishing you will need good quality bait or lures depending on the time of year and sea state, please ask Keith on what is best at time of booking. When you look in our gallery page you will see the fantastic sizes of pollock that has been caught so make sure you empty your freezer before coming fishing with us! If you have ever caught pollock or cod from a boat you will understand the feeling of the adrenaline rushing through you when you get that first knock. These fish have an amazing strength and power which will give any angler the goose bumps. Conger fishing is an experience of it’s own. These fish can weight up to 250lbs although the boat record is 133lbs from Brixham in Devon, but beware, strong footwear is essential as they can bite! Over the wrecks you can find fantastic hauls of Cod with bags of 20 to 30 fish with the biggest Cod recorded on the boat is 18lb 6oz! So there’s a challenge for you to beat! In clear waters the Cod enjoy some bright coloured jelly worms and in murky water, mackerel or squid. If you have a specific fish you would like the best chance of catching please drop Keith a line who will advise you on the best time of year. Generally Bass is best from May to September, Cod is from early spring along with Pollock and flatties. Most other fish seem to be caught all year round. Minimum number for the boat to depart is 6 persons.